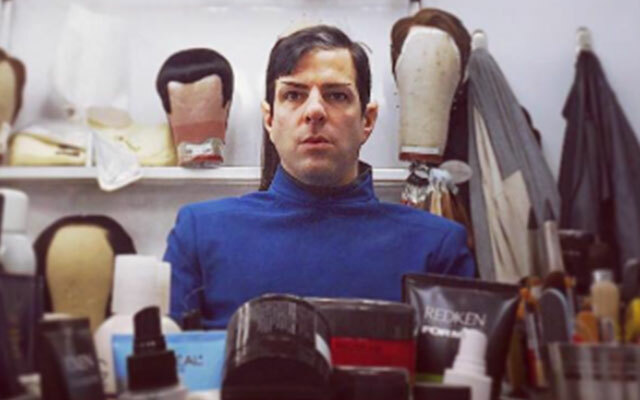 STAR TREK BEYOND star Zachary Quinto recently posted a photo to his Instagram account showing a variety of wigs that will be used while shooting the film. To Quinto’s left, appears to be a Vulcan or Romulan wig and possibly one to be worn by Chris Pine as Captain Kirk to his right. According to TrekToday, the shaggy wig with the white ponytail could potentially be worn by Sofia Boutella (who is brunette) was recently seen in the Vancouver filming area with similar looking locks. STAR TREK BEYOND, directed by Justin Lin and starring Chris Pine, Zachary Quinto, Zoe Saldana, Karl Urban, Simon Pegg, John Cho, Anton Yelchin, Sofia Boutella and Idris Elba will hit theaters on July 8, 2016. The film will celebrate the 50th anniversary of the franchise.